AmSafe ground vehicle restraints incorporates the most advanced technology available for their military seatbelt restraints. Superior materials, unique manufacturing techniques, and in-house dynamic testing to ensure soldiers are safe and secure. AmSafe applies its engineering expertise to develop innovative restraint systems for military applications. These unique restraints incorporate the most advanced technology and are designed to reliably protect military personnel in severe environments and areas of conflict both on and off the battlefield. AmSafe restraints are found in both vehicle and aviation defense applications worldwide. 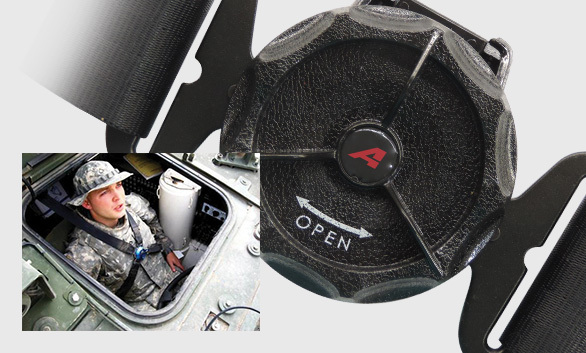 AmSafe utilizes in-house engineering expertise in vehicle dynamics and the operating environment to test, configure, and apply its proven seatbelt technology to unique military applications. AmSafe restraints endure rigorous dynamic testing to replicate real-world situations. All AmSafe restraints are designed for improved survivability, reliable performance in severe environments, and ease of use and comfort for the passenger. From concept through to production AmSafe restraints continually evolve to meet the distinctive demands of our military customers.